What do journalism students from top universities and journalists from BBC, CNN, and Telemundo have in common? They're all using iOgrapher products to capture their stories! Why bother using traditional, bulky, expensive journalist gear when you don’t have to? 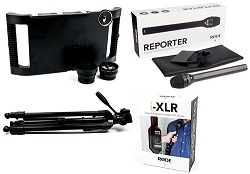 Instead, turn your own iPad into a serious filming rig with this comprehensive journalism kit. Become a journalist of the 21st century with this portable, unobtrusive kit that’ll let you dig right in to the story.